Depending on how the presidential race shakes out over the next four weeks, the biggest battle on Election Day may be for control of the U.S. Senate. Republicans currently control with 54 seats, Democrats (including two independents) have 46. Since the Vice-President breaks any ties, Democrats will need to gain four seats if Clinton wins, five if Trump prevails. Of the 34 seats up this year, 24 are currently held by Republicans. Looking at the Senate ratings from three pundits (Sabato, Cook, Rothenberg & Gonzales), 18 seats seem to be safe for the incumbent party. Of the remaining 16, five are rated safe by two of the three pundits, so are not likely to change hands. That leaves 11 competitive seats, only one of which - Nevada - is currently in Democratic hands. 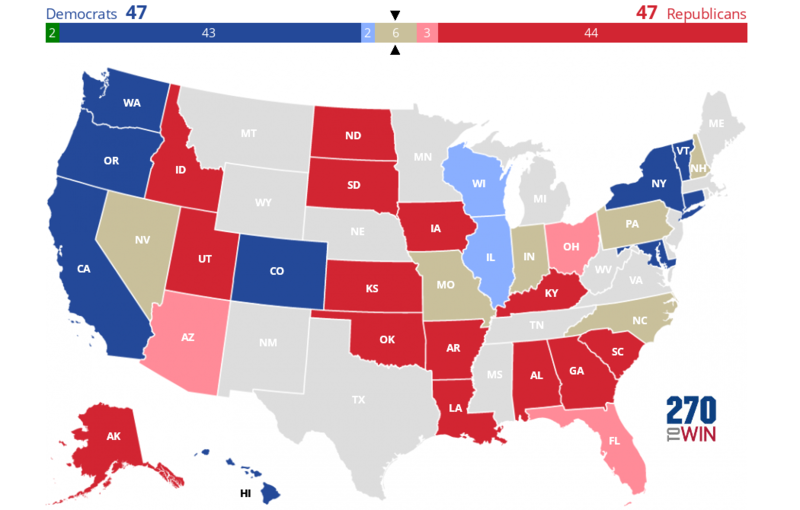 Click or tap the map to create and share your own 2016 Senate forecast.